You are currently browsing the tag archive for the ‘visual’ tag. 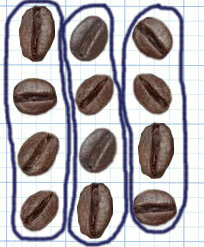 When I started teaching my son maths we did a lot of counting coffee beans. We would arrange 12 beans in groups of 3 and groups of 4… The idea was to start building up intuition and then segway into multiplication. Later we drew the ‘beans’ in the squares and then just drawing a circle in the box instead of placing a bean. This gradually led to tracing out the rectangle outlines of the groups and let the squares on paper take the place of actual beans.. so it abstracts really well in a fairly natural and unforced way. So this approach leads very naturally into some really nice mathematics. Along the way it reinforces the rote learning of times tables (auditory repetition) with visual intuition. I thought there was probably an App or web page to do this kind of thing interactively. I googled around and found lots of times table grids, math systems but nothing that seemed to take the grid-paper-rectangles-and-counting-beans approach into an interactive medium. AUS startups need to Recycle talent, more.